This entry was posted in professional learning and tagged EdCamp, EdCampAtl, Nikki Robertson, Wanda McClure by boadams1. Bookmark the permalink. I am an EdCamp virgin.I have heard about EdCamps on Twitter and blogs that I follow, but I have never attended before. I have heard nothing but positive experiences from those that have attended or organized an edcamp, so you can understand my excitement when I found out about EdCamp Atlanta. 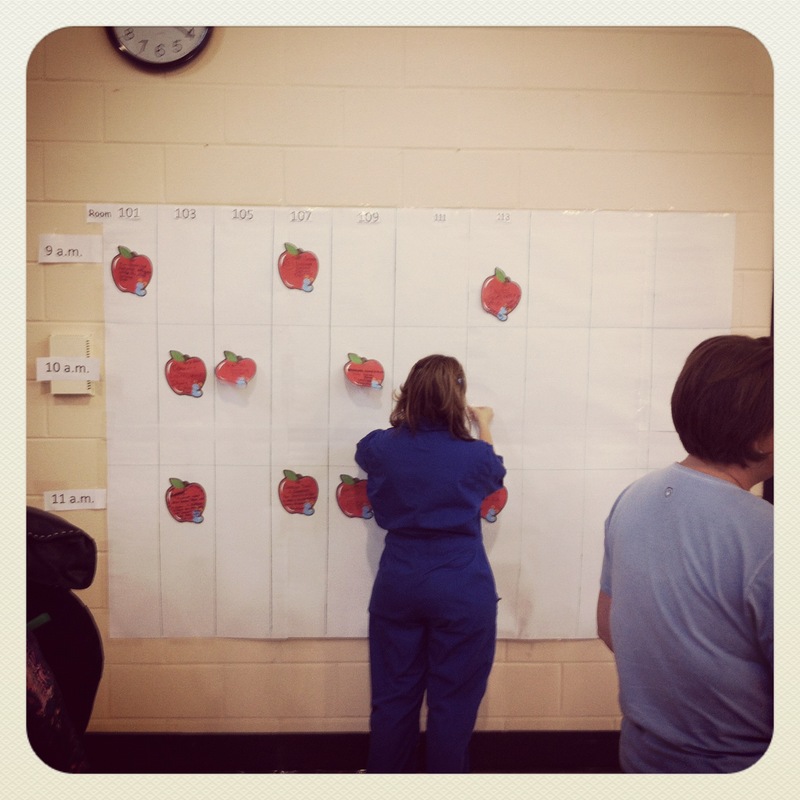 The unscheduled nature of an edcamp is both intriguing and unsettling to me. I am an organization freak. I love to look through the sessions offered at a conference as soon as the program is released. Mapping out my day is part of the fun for me. So I’ll admit to a little anxiety. What if I wander around aimlessly? What if I find myself in a session that doesn’t fit me? Will I have anything to contribute that the other attendees might find helpful? I am not completely sure about how everything works. Will I figure it out quickly enough to make the day worthwhile?Despite my ignorance I am counting down the days. When I attend traditional conferences I enjoy the sessions, but most importantly I enjoy time to meet and talk with other passionate educators. Sometimes I leave with more ideas and inspiration from those stolen moments than from the scheduled speakers. I believe the edcamps capitalize on this phenomenon. I have high hopes for my first edcamp and I know that there is a hard working group of people busy getting ready for the event. I look forward to meeting other teachers and librarians in my area. I hope to share some of the tips, lessons, and ideas that have worked for me and I know that I will leave with many new strategies to try. Any tips for an edcamp virgin? Any other newbies out there? Tamara Cox , the Eliterate Librarian, is a self-proclaimed “wannabe edtech geek” and middle school librarian in South Carolina. You can often find her with a computer in her lap and a book in her hand. She loves to integrate technology into education and help those that are nervous about taking the tech plunge. I was also struck by the traditional nature of the sessions within themselves. Certainly not traditional in the openness of technology use and assumption of goodwill (e.g., “close your laptops during our meeting…”), but traditional in the didactic nature of the sessions. 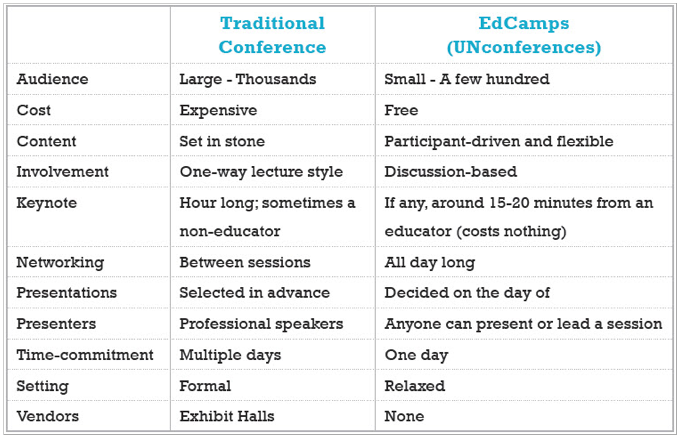 The structure of the day is not new nor unique with EdCamp. It is very reminiscent of Open Space Technology: http://schoolreforminitiative.org/doc/ost_description.pdf. With individuals that may have experience leading protocols (structured conversations), these one-hour long sessions could go even deeper. However, a wonderful day overall – full of learning and definitely the “pollen” Bo describes. Great reflective post, Bo. One piece of your reflection which really stands out to me is the question: how can we bring edcamp practices into our schools on an ongoing basis? We had some terrific smackdowns at St. Gregory, and each time I did them I wish we were doing them more often, and broadening them from just technology applications to broader teaching experiments. I know it is taxing for our busy teachers, but if we asked every educator on our team once or twice a year to do an ignite session, or a smack-down, in combination with brown-bag lunches organized like the edcamp agendas, plus regular ongoing CFG/PLCs, I think there is great potential. But of course as administrators we need to make this a priority and clear precious time and resources for it too. Excellent post. Agreed – particularly about Critical Friends Groups. With participants and a facilitator who all take their jobs seriously, the learning is limitless.